In the faceless chaos of Antony Micallef‘s portraiture there is a raw sense of relief. The British artist, trained under the great landscape painter John Virtue in the post-war style of Frank Auerbach, reclaims the emotion of the splatter. But rather than abstracted in some sort of Pollockian spread, the intent of the strokes, though hyperbolic, is clear. 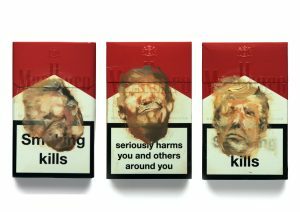 Perhaps that is why Micallef’s latest project “Trump Fags,” a visual double entente featuring the United States’s most malign White House hopeful, feels so decisively urgent to us now. 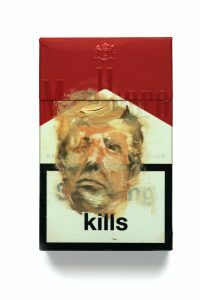 Oil portraitures painted onto bright red Marlboro cigarette packets, the three-image series was produced for the non-profit Peace One Day (an invitation from ambassadors Jake Chapman and Jude Law) and confronts the true nature of the fraudulent businessman and former reality TV star; a presidential candidate whose proposed policies intend to disbar nearly every already-marginalized group of the country and incite a domino effect of global disruption. 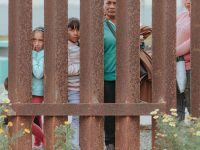 Though not the first to articulate critiques on Trump through artwork, today, on the country’s election day, Micallef’s warning has never felt so explicit nor entirely domestic, for America and the world at large: beware of the danger in front of you. 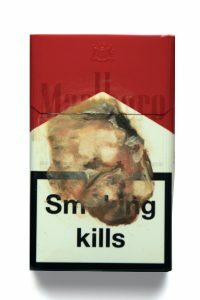 Triptych of “Trump Fags” by Antony Micallef. 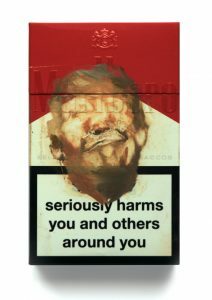 “Trump Fags” by Antony Micallef.